sweet Halley started kindergarten today. wasn't she just in J/K a minute ago? I really missed her at lunchtime today. Her seat was strangely empty. will be the last one in front of our red door. So while she was gone, Lulu helped me pack up my other baby. Quilt number two is heading off to be finished. This one is for me. Me alone. I used 5 charm packs for the front and appliqued birdies on random squares from the scraps that awesome Ashley from Lassie Girl sent me. The back is a super crazy mix of all of my Summer in the City pieces with a little chocolate zebra and polka dots thrown in. I am not sure if I like the front or the back better, but I do know that I cannot wait for it to return to me. Perhaps I can curl up and cry in it when I think about my baby girl being at school all day. You really should have started this quilting thing ages ago! Love the quilt! Kindergarten is a big sniff, my last baby started last year, it was hard, this year was worse! First grade is a FULL day, I really miss him! I think I need a quilt too! She looks so cute all dressed up and a messy flower in her hair! I bet she loved it. That quilt is wonderful too!! Love it. Once again, you are really giving me the itch to start quilting. Can't wait to see it all put together and quilted. It is going go to be wonderful! and that quilt is awesome! So much work! Loves the birds on the quilt! love the quilt. love it. Look how cute Halley is in her uniform! I asked her if she had a matching messy flower headband yesterday! I knew she would! Don't you love doing a quilt with a patchy back? It makes it seem like you have 2 quilts in 1!!! What a beautiful little girl! And I'm just loving her tennies. Full of style, she is! I pink puffy heart love, love the quilt! You are fabulous, my friend! My little one starts JK this year - exciting yet bitter sweet! Love the quilt - looks fabulous. congrats to Halley on starting Kindergarten!!! Umm, did you cut up a school uniform to make the matching headband??? HAHAHAHA!!!! I would so do that. :P Yes, the tennies are super cute too! Love the birdy quilt - love birdies! Halley is so cute!! She looks adorable! And that quilt? Want it. Enough said! So adorable and especially love the headband! 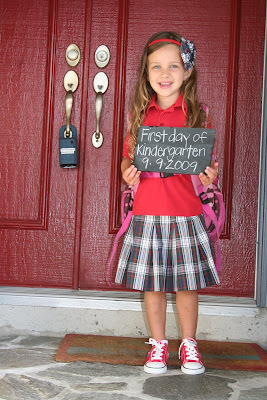 My 1st little one started Kindergarten this week too - sniff and double sniff! Question for you - do you (or anyone?) have issues with headbands in your daughters hair? No matter what type (smooth, with teeth, with Velcro added, etc) the headband falls forward in her head and she ends up looking a bit like rambo :) I am 100% all for headbands but if she can't make it through the day looking presentable, not sure this is going to last very long for me. Every day she gets off the bus I cringe thinking what she will look like! Thoughts or suggestions? Guaranteed the cutest kid wearing that uniform!! LOVE the matching messy headband and red kicks! That quilt adorable. I wish I had the patience to quilt! this is sooooooo great! imagine what you would get done if ALL your girls were in school?! but don't think about that...you'll be crying too much. seriously that quilt is so beautiful. Stop making me FAINT! LOVE the quilt so much. Please email me the names of cute fabrics so I can start making some cute stuff for my girls :) AND LOVE the cute Kindergarten pic of Halley! She is such a model like her Mommy! I love the quilt. First grade was the hard one for me - she's gone all day!! Love the quilt! Love how it's so pretty on BOTH sides!!! So many different fabrics too.